We analyze climate change in a cost–benefit framework, using the emission and concentration profiles of Wigley et al. (Nature 379(6562):240–243, 1996). They present five scenarios that cover the period 1990–2300 and are designed to reach stabilized concentration levels of 350, 450, 550, 650 and 750 ppmv, respectively. We assume that the damage cost in each year t is proportional to the corresponding gross world product and the square of the atmospheric temperature increase (ΔT(t)). The latter is estimated with a simple two-box model (representing the atmosphere and deep ocean). Coupling the damage cost with the abatement cost, we interpolate between the five scenarios to find the one that is optimal in the sense of minimizing the sum of discounted annual (abatement plus damage) costs over a time horizon of N years. Our method is simpler than ‘traditional’ models with the same purpose, and thus allows for a more transparent sensitivity study with respect to the uncertainties of all parameters involved. We report our central result in terms of the stabilized emission level E o and concentration level p o (i.e. their values at t = 300 years) of the optimal scenario. For the central parameter values (that is, N = 150 years, a discount rate r dis = 2%/year and a growth rate r gro = 1%/year of gross world product) we find E o = 8.0 GtCO2/year and p o = 496 ppmv. Varying the parameters over a wide range, we find that the optimal emission level remains within a remarkably narrow range, from about 6.0 to 12 GtCO2/year for all plausible parameter values. To assess the significance of the uncertainties we focus on the social cost penalty, defined as the extra cost incurred by society relative to the optimum if one makes the wrong choice of the emission level as a result of erroneous damage and abatement cost estimates. In relative terms the cost penalty turns out to be remarkably insensitive to errors. 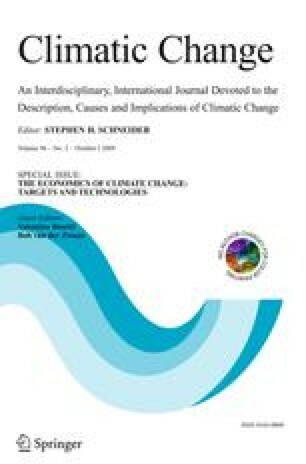 For example, if the true damage costs are three times larger or smaller than the estimate, the total social cost of global climate change increases by less than 20% above its minimum at the true optimal emission level. Because of the enormous magnitude of the total costs involved with climate change (mitigation), however, even a small relative error implies large additional expenses in absolute terms. To evaluate the benefit of reducing cost uncertainties, we plot the cost penalty as function of the uncertainty in relative damage and abatement costs, expressed as geometric standard deviation and standard deviation respectively. If continued externality analysis reduces the geometric standard deviation of relative damage cost estimates from 5 to 4, the benefit is 0.05% of the present value G tot of total gross word product over 150 years (about $3.9 × 1015), and if further research reduces the standard deviation of relative abatement costs from 1 to 0.5, the benefit is 0.03% of G tot .